This issue is another “old favorite,” one that–by the cover at least–I clearly remember from reading its week of release back in 1994. However, reading this in 2016, I’m not sure if I’d actually re-read this issue since then or not…and I’m leaning toward not. I’d forgotten that the earlier issues of this series had these painted covers, and a different style with the interiors that set it off from the main titles. There’s something to the issue other than the price that sets it off. And then there’s that price…this was a $1.95 book amidst $1.50 books…back when there was a bit more variance in price that didn’t seem QUITE so drastic as $2.99 vs $3.99. 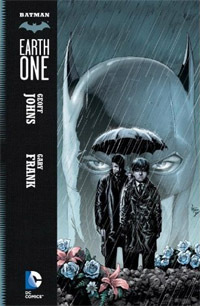 Playing nicely with the Zero Hour theme of randomish Time anomalies relevant to the given title, this Batman book sees the appearance of an older version of Alfred. This one is a bit larger and more of a bumbling butler and wanna-be PI than the cool, collected, tall, skinny actor/former soldier that’s become such a norm present day. 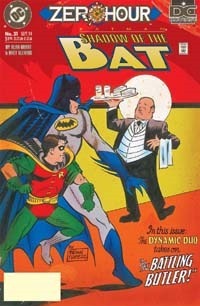 While Batman and Robin deal with some guy who’s gotten access to a hypnotic potion that allows him to get rich guys to “rob themselves” and give him the loot, we also get this story of a butler out of time, trying to fit in…whose appearance’s timing hits close to the heart as “our” Alfred has just recently resigned from being on Bruce Wayne’s payroll in protest for of Bruce’s unwillingness to stop so drastically recklessly endangering his own life. By the time things are resolved, this alternate Alfred fades away, closing out this one-off issue that closes with a simple THE END, rather than some To Be Continued or other cliffhanger. I don’t recall when Alan Grant left the title, and didn’t remember he was still on the title at this point, though I believe this title was essentially created “for” him when there was a shuffling on Detective and Batman. That’s really not here nor there for Zero Hour, though, except to point out that his name on this and what he brought to this story is a real treat…particularly for being essentially a self-contained issue that plays nicely in the Zero Hour sandbox without really raising any problematic questions nor confusing someone who read this issue solely for being a Zero Hour tie-in rather than the next issue of whatever other story could be going on at the time. Visually, I quite enjoyed the art, and the early pages really strongly put me in mind of the 1990s Batman: The Animated Series, which was a welcome touch. That was a stylistic thing, something with the linework and especially the colors…and yet the character designs are definitely NOT that style associated with the animated series, and really fit the comics as-is for the time this was published. I remember knowing just enough Batman history to realize even at the time that this was an earlier version of Alfred; though as of this typing I fail to recall if it was Golden Age or (more likely) Silver Age. Other than the actual fact of this Alfred’s presence and a reference TO wonky stuff going on with Time, this issue doesn’t do anything with Zero Hour in itself–no particular plot point is picked up or driven forward or scene expanded and elaborated on…this is just a great one-off issue that takes advantage of the notion that anyone from anyWHEN can show up and it makes sense without needing to set things up within the issue nor wrap it up by the end. This was a real treat to (re)read, and really a truly great single issue…offhand probably the most self-contained thus far and as such extremely worthy of acquiring–whether from a bargain bin, dollar bin, or up to $4 (cover price $1.95, but this equals and/or vastly surpasses many contemporary $3.99 books of 2016)!